It just so happened that two of the classes I wanted to take at Viking were very close together! I'm a huge fan of macarons. I spend way too much money on them, considering they only last a bite or two. So I've been wanting to learn how to make them for a while now. That said, I have a handy little kit to help me make them, but the instructions completely intimidated me. I needed to see how it was done firsthand. So I joined a class at Viking that also included some sweet whoopie pies. 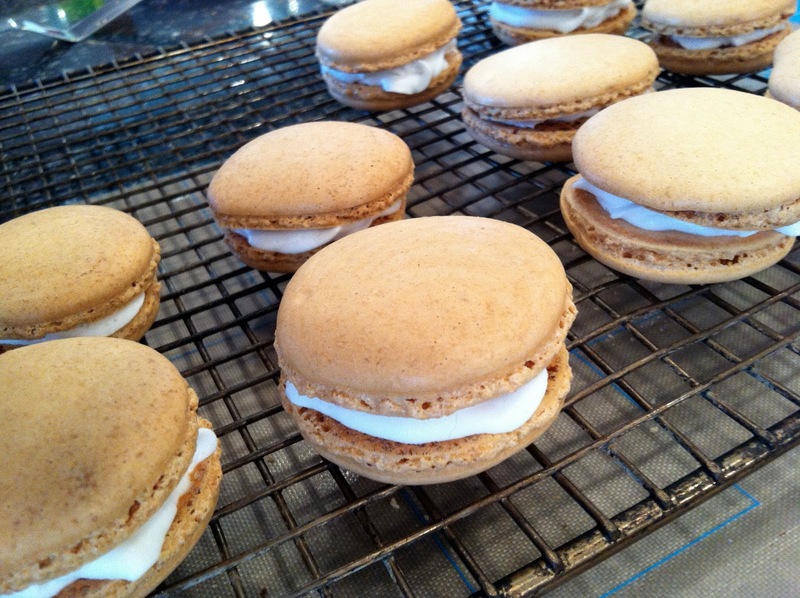 Macarons are just tricky. From getting the egg whites just right and not overmixing, to banging out the air bubbles, to letting them sit for TWO HOURS because these little suckers are sensitive. As you can see, some of them turned out and others didn't. Our team's macarons were split between two different stoves, which I believe had an impact on our results. They were a little crunchy for my taste, but I was proud of them just the same! We filled them with lemon buttercream, raspberry buttercream, and chocolate ganache. The whoopie pies were more straight-forward. It was kind of like making little cookie cakes. We made an amazing marshmallow fluff frosting to pipe in between the pies. The instructor asked if anyone wanted to eat the remaining frosting off the whisk attachment, and I was the only one who said, "Heck yes!" After I tasted a bit, everyone came over to try some. Guess no one else wanted to admit how much they wanted to be a kid and lick it off the whisk! When I brought the box of goodies home, I think the whoopie pies were Duke's favorite. He worked late at the brewery and when I woke up, I noticed that about half of my pies were missing! :) That sounds like a winning recipe, right? Is there a recipe you're too intimidated to make? Yummy! I love whoopee pies!